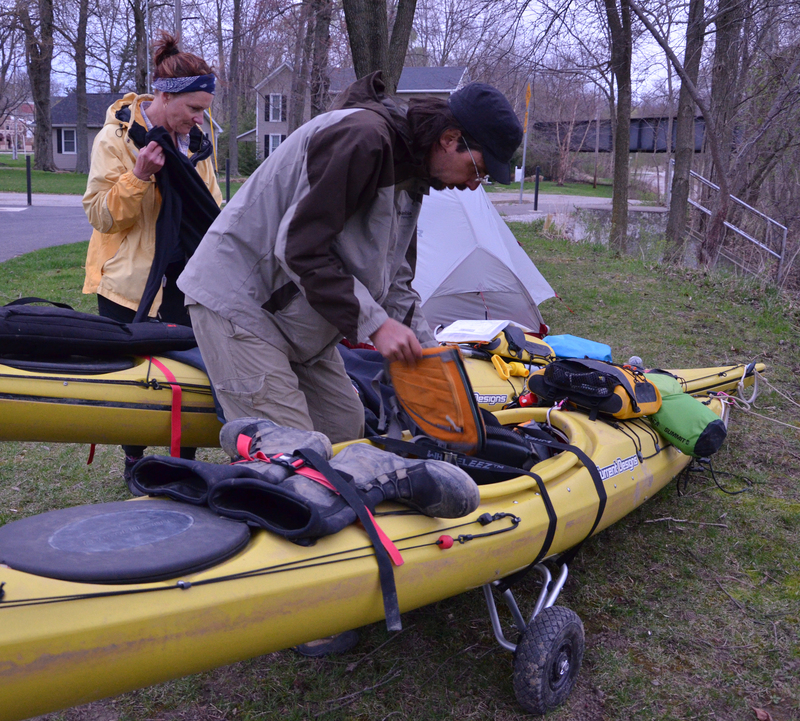 From the source of the Wabash River, John and LaNae Abnet plan to spend the next four months kayaking and camping on their voyage to the Gulf of Mexico, and, to their knowledge, they’ll be the first to document it. On April 12, just two weeks into their trip, the Abnets stopped in Wabash to camp for the night on the River Walk near the Wabash Street bridge. Although the couple has never reached out to the local papers to publicize their journey, somehow word always gets around. As Mrs. Abnet recalled, while in Wabash, a curious jogger had stopped by and heard their story. “He’s a great guy and big on the (Wabash River Defenders),” Abnet said. “It’s just funny how people come out of the woodwork (as we travel from bank to bank). Beachamp announced the couple’s journey at the Wabash County Comissioners meeting on Monday April 13 where The Paper of Wabash County picked up the story. Originally from Berne, near the Ohio state line, the Abnets began planning every detail of their trip a year prior to setting out, including mapping out the post offices along the entire route, dehydrating meals for every day of the trip, and Abnet quitting his job. “And then we’ll be broke,” Mrs. Abnet said with a laugh. The 1,591-mile journey will take four months to reach the Gulf, or so they’re guessing, according to Abnet’s calculations. “We did the math,” Mrs. Abnet said. When the couple originally started their journey on April 1, they were dragging their boats behind them for 18 miles over three days. The Abnets have kayaked for many years, taking many trips to the Artic Ocean and traveling through northern Canada, Mrs. Abnet said. So while they’re experienced with kayaking, Mrs. Abnet admitted they have never done anything this lengthy. In March 2014, the Abnets attended the Quiet Water Symposium at Michigan State where they made an inspirational acquaintance. Although the couple isn’t doing this journey for any recognition, Abnet said that while they are out there they might as well do something worthwhile and bring awareness to a charity called Fortress. “(Fortress) is a really good cause,” he continued. “There’s a woman in Uganda doing great things for pregnant moms. … She’s got this little rented place that’s quite a ways from the hospital and they’ll put a girl in labor on the back of a motorcycle and get her to the hospital. … It’s great but it’s not sufficient for all the work that they’re doing and they want to get their own place. To follow the Abnets’ journey south or to donate to the charity, visit separateboats.com.